We've seen some amazing man-made and natural wonders of the world on this trip - Great Wall of China, Mt Everest, the Potala, the Ganges ... - and each one has been mind-blowing for such different reasons. 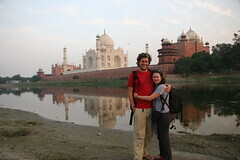 And now we have come to the Taj Mahal, one of the greatest monuments to love ever constructed. 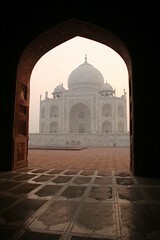 The white marble glows in the light but its real beauty is in the fine inlay detail inside the tomb. We also had the chance to meet a stone artisan who is (allegedly) member of one of the families whose forebears built the Taj, and who have inherited that skill and now work on its restoration. Of course, it could have been a load of codgers told in an effort to persuade us to part with cashola in exchange for inlay marble tables, but he told a great story!